【日本語訳付き】Peppa Pig フレーズ集　Hide and Seek 編 | English Culture for Kids! 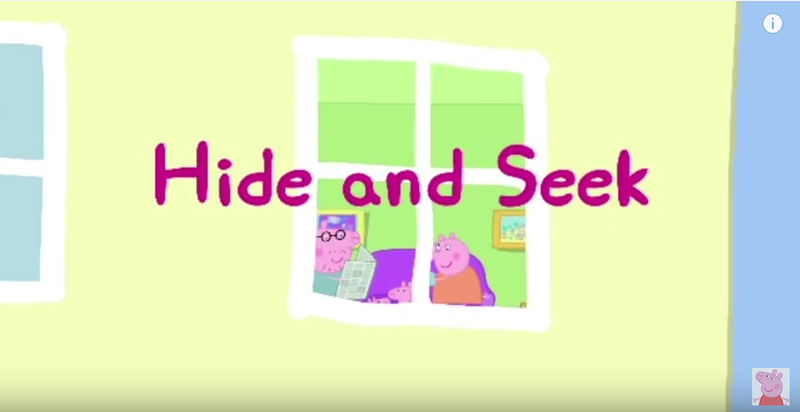 Narration: Peppa and George are playing hide and seek. Daddy: George, have you thought of looking upstairs? Daddy: Oh I think George should have another turn. Daddy: Oh dear. I wonder where he can be. Actually, I think there is something about George in this newspaper. It is George’s turn to hide. He must quickly find somewhere to hide before Peppa finishes counting. Narration: George has found somewhere to find, just in time. Peppa: …10. 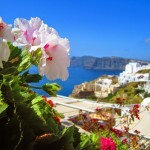 Ready or not here I come! 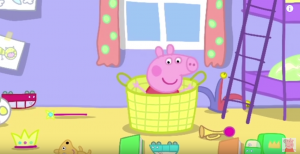 Narration: Peppa has to find where George is hiding. Narration: Peppa has found George. Peppa: George, I could see you too easily. Narration: Now it is Peppa’s turn to hide. Mommy: I’ll help George to count. 1, 2, 3, 4, 5, 6, 7, 8, 9, 10. OK George, open your eyes. Narration: George has to find where Peppa is hiding. 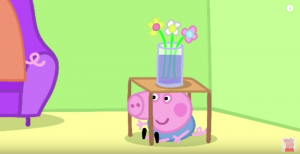 Narration: Peppa isn’t hiding under the table. Narration: Peppa isn’t under the bed. What was that strange noise? Peppa isn’t behind the curtain. There is that strange noise again. What can it be? Narration: George has found where Peppa was hiding. Peppa: George found me. Now it’s Daddy’s turn to hide. Peppa: But George isn’t very good at hiding. Daddy: I’m sure he’ll be better this time. Close your eyes and start counting. Narration: Oh dear. Peppa will easily find George. Daddy: George, come over here. Peppa: …10. Ready or not here I come. Oh…George isn’t hiding under the table. But George always hides under the table. Daddy: Have you thought of looking upstairs? 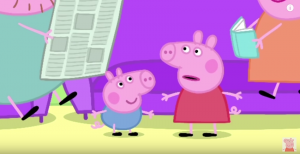 Peppa: I know where he is! George is in the toy basket. Oh. Narration: George is not in the toy basket. Where can he be? Peppa can not find George anywhere. Peppa: Daddy, I can’t find George anywhere. Mommy: Oh George. That was a good place to hide. 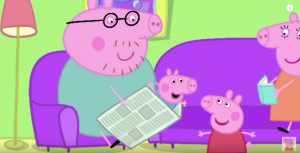 Narration: George was hiding behind Daddy Pig’s news paper all of time.